Join us for a Twitter Party on Thursday, 1/31 to Thank All Mentors During #NationalMentoringMonth! Read more about why one mentee thinks her mentor deserves "Mentor of the Year" status! Sign up for post-match trainings like Cultural Competency and Poverty Spiral. Wednesday, February 20th, 2-4 p.m. This informational session is intended to introduce mentoring programs to the technical assistance, training and networking services provided by The Mentoring Partnership of Southwestern PA. The foundation of our services is based on the six Elements of Effective Practice, a collection of research-informed practices for youth mentoring programs. Click here to register. Mentoring 101 -- February's session is full, but there's plenty of room in March! Have new mentors volunteering with your program at the start of the academic year? Make sure your mentor volunteers are informed of best practices and are equipped with the skills needed to begin a successful, high quality mentoring relationship by encouraging their participation in a Mentoring 101 Training. Seating is limited! Back by popular demand, TMP will be offering post-match trainings at our offices this Spring. Trainings include Cultural Competency, Understanding Challenging Behaviors and the Poverty Spiral. Click here to sign up. Attendees must have previously participated in a pre-match training. Major League Baseball and Scholastic has launched the 23rd Annual Breaking Barriers: In Sports, In Life essay contest. The Pittsburgh Pirates encourage all fans in grades 4-9 to participate in this national league-wide contest celebrating America’s pastime and the inspirational influence set by number 42, Mr. Jack “Jackie” Roosevelt Robinson. Breaking Barriers: In Sports, In Life is an educational program designed to teach young students about the obstacles Mr. Robinson faced as he broke baseball’s color barrier. After researching about his life, students are encouraged to write and submit an essay about barriers or obstacles they have faced or are currently facing in their lives and how they used the values exemplified by Mr. Robinson (citizenship, commitment, courage, determination, excellence, integrity, justice, persistence and teamwork) to deal with those challenges. For more details on the contest, please visit scholastic.com/breakingbarriers. All entries must be mailed or submitted digitally to Scholastic no later than Thursday, March 14, 2019. Help Us Celebrate Mentors with a Twitter Party on 1/31! It's not too late to celebrate National Mentoring Month in January! 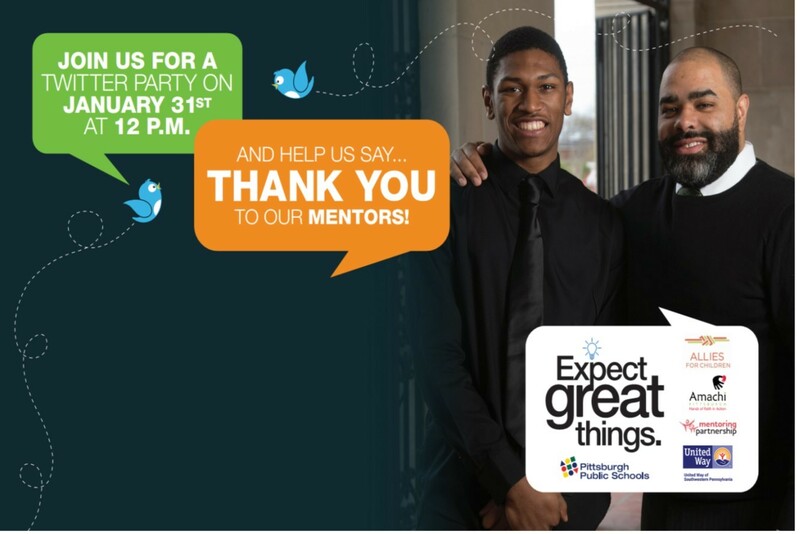 TMP is co-hosting a Twitter Party on Thursday, January 31st--Thank Your Mentor Day! Join us, Pittsburgh Public Schools, United Way of SW PA, Allies for Children and Amachi Pittsburgh as we say THANK YOU to all the mentors who support young people in our region and beyond! The party starts at noon--just log in to Twitter and use #PPSMentorsMatter to join the conversation! "I'm Very Grateful to Her for Introducing Me to New Experiences..."
Youth Connection, a Venango County-based mentoring program, recently began accepting nominations for its Mentor of the Year Award. Click here to read the amazing story of why Kelly Harris deserves this honor, as written by her mentee!